Heading somewhere special this summer? After you’ve packed your sunscreen, don’t forget to bring the other travel necessity – something to read. 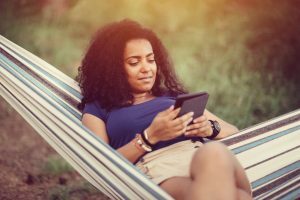 Did you know you have access to thousands of free eBook and eAudiobook titles with your library card? The Overdrive apps (Classic or their newest app, Libby) make it easy to read or listen to books on your iPad, tablet, or smart phone while you’re on the go. And now, you can also check out eBooks on Hoopla. Stop in to your local branch and find out more about Overdrive or Hoopla just in time for vacation season.